In a setting of significant change within the HE sector and amongst the creative industries, the conference will consider the future for teaching, learning and scholarship. ‘Imagining the Future’ will be informed by an analysis which takes account of the political, economic, social and technological forces currently at play. In February 2014, the Journal of Creative education accepted the article proposed by IPRASE about creativity and innovation in the educational field. Through a literature review, the authors F. Pisanu and P. Menapace describe the results of two decades of research on creativity and innovation in the educational and organizational field, to underline what seemed to work and what did not, to enable these processes functioning effectively. 15th/16th January 2014 2nd Practitioners seminar in UK - London. Culture, creativity and innovation: is it an attractive investment? Is there a challenge for education and Lifelong learning policies? Policy makers, Universities and Enterprises share Strategies, Policies and Practices to foster innovation. Join us to contribute, learn & smile! The CLEAR newsletter now available online! Creativity & Innovation: Questions & Messages from the transnational review and the stakeholders seminars in four EU countries. Thom Murphy, Scott Wilson, Michelle Lowe-Holder, Azumi & David: International fashion designers from London work closely with 10 handicraft enterprises eager to innovate in Osterøy. Under the auspices of Bergen University College and CLEAR project! CLEAR at the "Festival of Learning"
CLEAR has been invited to the Festival of Learning to contribute to the Workshop "Jobs and skills for continous training: the new demand for competences in companies"
"Competition and diversity in UK Higher Education"
As UK Government looks to create a more diverse, competitive Higher Education sector, sessions will focus on the challenges and opportunities afforded to the sector. GuildHE CEO Andy Westwood agreed to contribute by bringing in CLEAR issues about creativity and innovation. 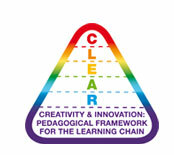 The CLEAR partnership meets in Bilbao & Errenteria at FVEM and TKNIKA' premises to share the outcomes of the Seminars and identify the major trends and main remarks proposed by Practitioners and Policy makers in the field of Creativity and innovation in tertiary,& executive education and lifelong learning. CLEAR project has been selected to contribute to the LINQ2013 at the FAO Headquarters in Rome (Italy), the 16th and 17th May 2013! The CLEAR partnership met in London at Ravensbourne college and at GuildHE to share the results of literature, policy and practices analysis to be disseminated during the upcoming Seminars and National Conferences. The UK cases were presented "live" by organising the meeting at Ravensbourne college and by inviting Plymouth school principal to the event.